My uncle Richard worked at Cape Kennedy from the Gemini days into the Space Shuttle era. We rarely saw him or his family, since we lived in southern Indiana and he was so busy. During Gemini, I used to sneak astronomy books into my fourth-grade class and read them but somehow did not realize that this space program they discussed was actually happening. But one day, Uncle Richard called to say they would come and visit us if "Apollo 7 cleared the tower". I was nine years old, we watched the launch, and from then on I was hooked on Apollo and NASA. Though we rarely spoke or wrote to each other, my uncle's example (and the Apollo effort) is what led me to being an engineer. After Apollo 7, when Uncle Richard visited, he gave me a diagram of the Command Module main instrument panel, and colored in the dials and switches for which he was responsible. It was a diagram from CM 012 on AS-204 (Apollo 1). I would sit for hours pretending to be on a mission. I missed the "Tranquility Base" transmission when Neil used that term for the first time right after The Landing. My family had gone to a picnic earlier that day. I was upset we would miss the landing, and my dad finally relented so we rushed to my grandparents house to catch it. I think we missed it by about fifteen minutes. But I was allowed, being only ten, to stay up and watch the EVA. And all through my youth, the only time I was allowed to stay up late and watch anything late was if the astronauts were doing an EVA. Later, my uncle was part of the team to go over to Russia in preparation for the Apollo Soyuz Test Project. I have one NASA video showing him in conference there. After that flight, while I was in high school, he let me borrow his flight manual for the Command Module. It was something like three volumes, and I poured over it, over and over. It was a sad day when I could not come up with with any more excuse to not give it back to him. My only other memorabilia from the space program is a search chart my uncle sent me, not long before he passed away. It was one of his debriefs for the STS-51L (Challenger) debris field. I keep it up on my office wall to remind me, as an engineering manager, to always listen to my staff. I graduated with physics and electrical engineering degrees in 1981. I wanted to be an astronaut, but a physical condition prevented that. I've never worked for NASA. Instead, as an engineer, I've worked on military projects (F-15, MX Peacekeeper, P-3 Orion sub hunter and others). When we won the first Cold War, I got into commercial electronics like so many others, and have worked on airline telephony, Internet over satellite communications and other things. My wife and I have four children, the oldest of which is off to college, majoring in computer science. I'm an ordained minister, but still work as an engineer, presently managing test, tech support and IT departments for a small company in northern Indiana. NASA is still on my mind. I am Lunar Certified, meaning I am allowed to display moon rocks, and I participated in the Starshine project. This was a series of satellites that looked like disco balls, being covered with hundred of one-inch mirrors polished by grade school and high school from across the world. The satellites were placed in orbit by space shuttles, and one hitched a ride on board the first launch from the Kodiak Space Center. I can't wait for us to get back to the Moon, and on to Mars, and would enjoy any opportunity to help in that regard. The space program has had such an impact on our society. It goes way beyond pushing technology (IMHO, the first personal computers were the two sitting in the CM and the LM) and all of the too-numerous-to-count spinoffs -- all of which have benefited us back on planet Earth. Back in the hey day, our whole society went to the moon with Neil and Buzz and the rest of the guys, and there was a whole generation of scientists and engineers that came out of that. If my uncle, who milked cows on a farm when he was growing up, could work on something like Apollo, then there was nothing I couldn't do -- nor anyone else, for that matter. 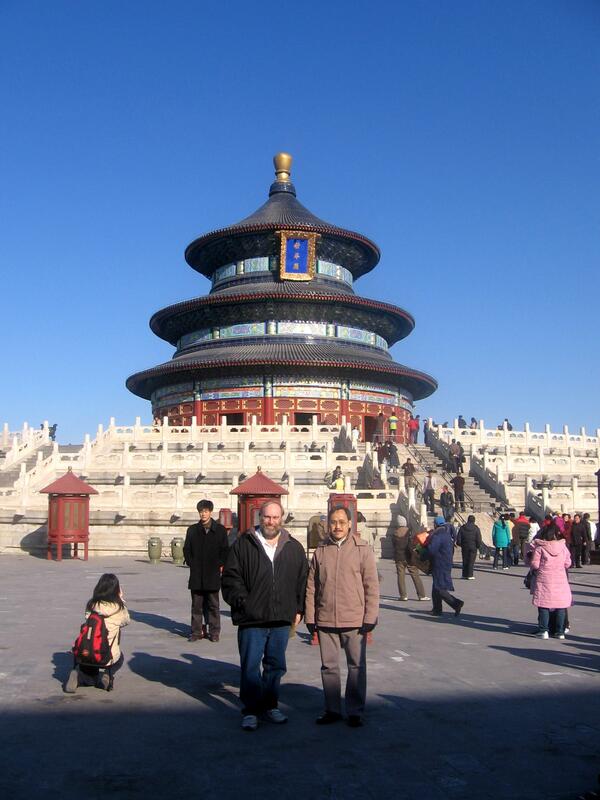 Editor's Note: Dave's portrait was taken outside the Altar of Prayer for Good Harvest / Temple of Heaven in Beijing during a late 2007 visit.Click on the image for the full version.